Info- BeetBuster's Buster Machine. Transforms from Beetle to Crane Car to Robo. Combines with Stag Beetle to form Buster Heracles. Info- StagBuster's Buster Machine. Transforms from Stag Beetle to Jet. 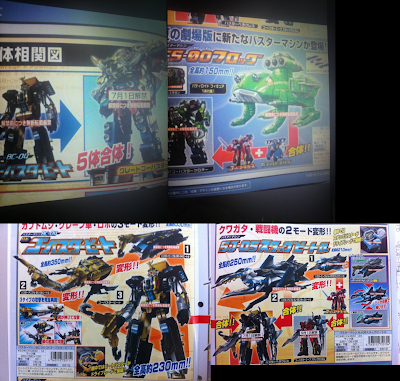 Combines with Go-Buster Ace to form Go-Buster Ace Stag Custom; combines with Buster Beet to form Buster Heracles. In Jet mode, it can slide on/launch from Buster Beet in Crane Car Mode. It's pincers move in Stag Beetle Mode. Info- Movie version Buster Machine, recolor of Rabbit into a Submarine/Frog. Doesn't seem to have alternate mode, rather, it's just an amphibious vehicle (yeah....I know, bad pun.) Frog combines with Ace and Gorilla to form Go-Buster Kero Oh. While there's no way to be sure...the name sounds too much like a certain sergeant to not take it as yet another reference. The Gattai between the 5 Buster Machines- Ace, Gorilla, Rabbit, Beet and Stag Beetle. TOKU INSIDER WILL BE LAUNCHING A PODCAST IN THE COMING WEEKS. IT IS LIKELY A ONCE-A-MONTH DEAL. MORE INFO SOON!